Sadly, ABC Radio is no longer commissioning projects through the Regional Production Fund (RPF), this funding now pays for 24 hours of news a day. Always cheery.The Regional production Fund website is now an archive. The ABC Radio Regional Production Fund commissioned work from experienced radio producers and talented content providers who lived outside the major capital cities. (Residents of Darwin and Hobart were also eligible to apply.) The fund commissioned documentary features or series, music segments, drama, comedy, serials, short stories, history, poetry, discussion programs or creative broadcast events. 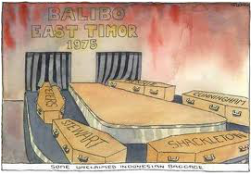 On 16 October 1975 five Australian journalists were murdered at Balibo in East Timor. Anne E. Stewart (sister of sound recordist Tony Stewart (one of the Balibo Five) offers a personal insight into his very public and political death. We hear from a mother grieving for her first-born, a family in shock and friends who await Tony's return to be the best man at their wedding. Anne's work as a professional storyteller has her pondering the 'mythology' of the Balibo Five in her telling of the Stewart family's story. In the program Anne recalls her visit to East Timor in 2003 for the dedication of the Balibo Community Learning Centre to the memory of her brother and his colleagues and the celebration as it is handed back to the local community. In 2004 the ABC's Regional Production Fund commissioned acclaimed storyteller Anne E Stewart to write and produce a 20 part radio series bringing to life the people involved in the events leading up to the Eureka Stockade, and what happened in the aftermath. The series was produced by Paul Nunn, and takes the listener on an aural journey back to the days of 1854 upon the Ballarat goldfields; we meet the men and women who had come from all over the world in search of gold, only to find themselves involved in events which would soon escalate into a fatal confrontation. The series begins with words from one of Ballarat's original inhabitants, Aunt Lizzie from the Wathaurong people; we then head in to the sprawling mining settlement of Ballarat to meet figures on both sides of the law who influenced one of the defining moments in Australia's democracy. Along the way you'll meet the likes of John Basson Humffray, the powerful Welsh voice of democratic change; Peter Lalor, the Irish firebrand who encourages the miners to take up arms; James Oddie, the great philanthropist known as 'the father of Ballarat'; Anastasia Hayes, who sewed together the original Southern Cross flag; Anne Stephens, who was inside the Stockade when the British redcoats made their surprise dawn attack; and the inimitable Rafaello Carboni, the Italian anarchist who wrote the only eyewitness account of the events leading up to and after the Eureka Stockade. The battle of the Eureka Stockade is officially said to have occurred at 3am Sunday, December 4, 1854 - but the agitation for miner's rights had been going on for some years previous; the effect upon Australian democracy has been felt ever since. 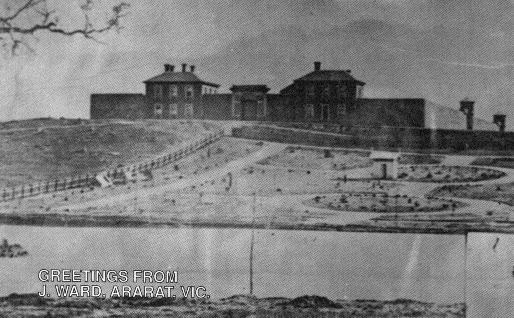 There are some incredible tales from the beginning of Ballarat and regional Victoria; stories of hope and hardship, love and loss. Storyteller Anne E Stewart is able to capture the mood of each time, and portrays with verve and passion the spirit of the people in each mini-saga from the early inception of our Australian heritage. 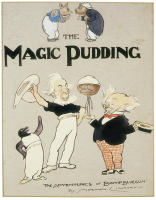 Click here for a short description of each story and the audio sits to the right of this page.